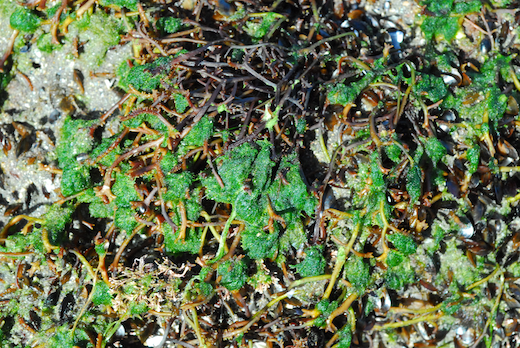 Description: Gametophytes epiphytic on red algae, 10-30 mm in length, tufted, light green in colour, filamentous in construction becoming entangled rope-like when older. The sporophytes occur as filamenous endophytes in red algae such as Polyides rotundus and Dilsea carnosa. Habitat: found in spring and early summer as epiphytes on cylindrical, branched red algae such as Furcellaria lumbricalis, Polyides rotundus and Chondracanthus acicularis in spring (February-May), on lower-shore rocks. Relatively uncommon. Key characteristics: occurrence in spring, the light green colour, the development of a rope-like construction when older, and the epiphytic habit. Similar species: species of Cladophora, such as Cladophora rupestris. Site © M.D. Guiry 2000 - 2019. Important copyright notice: all text, design and photographs on this site are copyrighted by M.D. Guiry unless otherwise stated and all rights are strictly reserved. Click here for copyright information and contact. Website design: 249 Design Studio. Site maintained by M.D. Guiry (michael.guiry@nuigalway.ie). There have been 8736738 page loads since 1 January 2014 on 25 April 2019.